It’s time to start getting serious, guys. NaNoWriMo is officially less than a month away, and that means we all have to warm up our endless chocolate fountains, lay in supplies of chips and energy drinks, and schedule a time for the concrete mixer to come pour a barricade to secure the door to your office. But before we do any of that, we need to pick our weapons of choice. Tasers are great for keeping inquisitive family members out of the way, but I’m talking big guns. You need to pick a writing environment. For paper-scribblers and typewriter fiends, this involves lovingly crafted notebooks and smoothly sailing pens, or oiling the switchbobbles and haptwagglers on your favorite machine. Okay, so I might not know very much about typewriters, but I do know a thing or two about word processors, and that will be our topic of discussion today. You’ve got a couple more options than you might think. There’s good old Microsoft Word, of course, but there’s also Google Docs or the Adobe Acrobat suite for automatic cloud backup. There are word processors for your tablet and your cell phone. There’s Write or Die for distraction-free motivation, although it doesn’t save your work. And within all those programs, there are options and customizations and changes and fonts and formatting enough to make your head spin. Finding the perfect writing environment is about more than your favorite blanket or a comfy couch. You spend a lot more time looking at the screen and the keyboard than at the coffee shop menu…or at least, you should. For me, my preferences have changes a lot since I did my first NaNoWriMo in 2009. Back then, I was a Google Docs girl. The cloud was new and exciting, I didn’t know that the file would barely open once I reached 80,000 words, and the idea of hidden text markup never even crossed my mind. When I went to format The Last Death for publication several years later, I realized my mistake. Microsoft Word hated everything I had done, and I had to go through the manuscript line by line to change the spacing of every single one of them. It took forever. It was a nightmare. I vowed to learn from my ignorance and never encounter that problem again. So now, I use Word to start with. I use the same CreateSpace template I use to print my paperbacks, and that saves a ridiculous amount of time. It also makes me feel like I’m actually writing a book, because the words I write appear on the page in exactly the same way as they will when the story is printed. It makes it feel real, gives me a little extra ego boost, and it saves a billion hours in tweaking when it actually goes to print. I keep my file on a USB stick, and back up to Drive or my email pretty much every day. I’m always working from exactly the same file, just as I would if I was cloud-based, and I haven’t had a major problem with the method yet. For more of my favorite gizmos, revisit my entry on tools of the trade. Are you going to take the challenge this year? What’s your favorite word processing tool? I’m a college sophomore and have decided to take up the challenge this year! I hope I’m ready. Welcome to the club! Whether you win or not, it’s tons of fun. Write or Die looks incredible! I love it. Might have to use it. I tried the USB thing. Three USB drives later, I’ve realized they all inevitably end up in the washing machine. I can’t have small and nice things. I love Word. You can do a lot with it, easy to format, and it just keeps things clean. All my notes and organization ends up in a notebook dedicated to the story that evolves as the story does. Looking into the CreateSpace. Not familiar with it. I attempted Storybook, but I find that I don’t like having my notes on the computer where I’m switching back and forth between screens. I like just flipping through my notebook in front of me. Girls have an advantage in this arena. I never put a USB drive in my pocket – I just stick it in my purse. Doesn’t get washed, and hasn’t gotten lost yet (knock on wood)! You’ve convinced me! I need a purse…. 😛 That is an awesome advantage. I’m so glad to see I’m not the only one that writes on the CreateSpace template! It saves so much time, doesn’t it? I’ve gotten so used to it that I rarely write fiction any other way. Don’t underestimate the motivational power! Breaking it down into 1667 words a day is really manageable, and the community and pep talks are a great way to keep yourself moving, even if you think you write too slowly to get it all done. And besides, you can work on the same novel. Only count what you do in November towards your stats, and no one will know the difference. Ah. I was under the impression from something I read years ago (of course from a 3rd party site) that beginning before November was ‘cheating’. I fluctuate how much I can write in one day (it’s all inspiration), but on good days, it’s well into that range. So, maybe I’ll give it a shot! In my mind, it’s only cheating if you add what you did in October to your November total. As long as you write 50,000 words within the allotted time frame, I don’t see that it matters too much whether you start at word 1 of your story or word 34756. Can you explain more about the CreateSpace template? Sure! When you add a new paperback title to CreateSpace, it asks you to choose a trim size and offers you a Word template to help you with formatting. Basically, they use some sort of magic to create a document that only lets you enter text into a space of the proper dimensions for the trim size you choose. It makes it so much easier to upload your file when you know your text will fit into the printable area. In regular old Microsoft Word. It downloads as a .doc file readable by any version you might have. I write my stuff mostly in Scrivener, fullscreen mode so I ignore the internet. 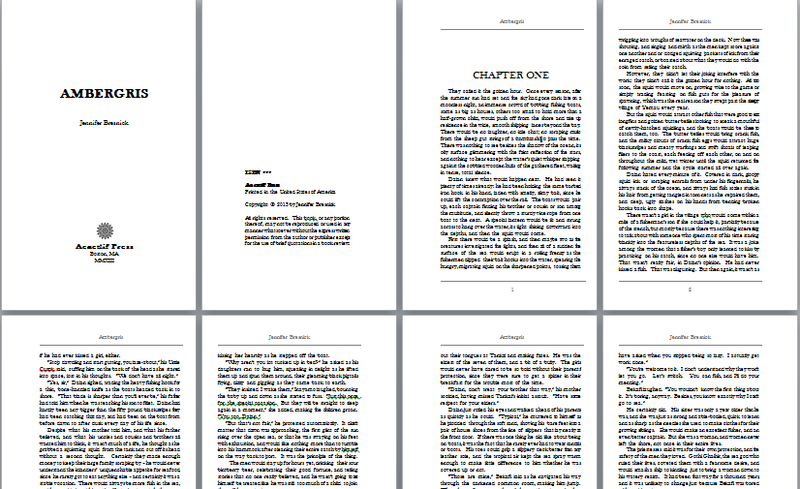 That being said I copy-paste it all into Word later and have a Createspace template that is spiffy and amazing. I’m going to try and finish a rewrite BY November so I can write the first draft of a different novel for NaNo. Bit ambitious, yes, but if worse comes to worse I can just finish the rewrite for NaNo instead. 😀 Good luck!